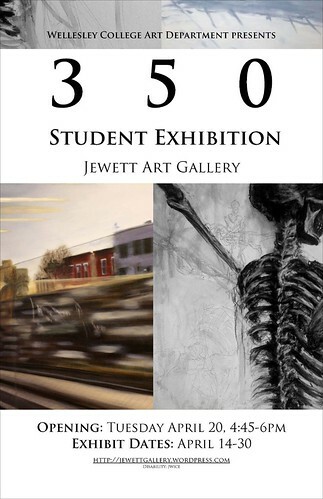 The Jewett Art Gallery is pleased to present an exhibition featuring students who completed 350 level studio art projects this year in conjunction with works by students from the ARTS217 Life Drawing course. The exhibition represents a wide range of subjects as well as traditional and contemporary approaches to various mediums. My desire in this work is to acknowledge the beauty and depth of the fleeting, every day, and frequently overlooked moment. In order to recognize the existence of time and space within each overlapping moment, I painted these pieces in thin layers of glazes. Caught within the blurriness of time and also within the layers of static reflections and multiple lenses of the eye, camera, and window, I explore movement and stillness within the same paintings. My project focuses on the daily and the habitual, both in subject and in method. I attempted to paint a single painting per weekday, making my subjects all items that I use on very a regular—if not daily—basis. All items were painted in a one to one ratio scale for size of the object. I began with objects that I personally associate with the morning and getting up, and have begun to progress toward objects that I use or associate more with the afternoon and evening. This project takes the objects that we use so constantly and consistently in life (such that we almost come to disregard them through overuse) and isolates them within the frame of painting, forcing a second, more empirical and impersonal evaluation of the items themselves, as well as the personal relationship that we hold to them. I started my independent study with a goal to paint landscapes. I am a nature lover. Its beauty, its myriad of colors and its movements have always intrigued me, and I want to portray that with my brushes. I use to paint landscapes from photos I have taken myself. Now I am challenging myself to paint with not just a single photo reference, but many photo references, so I can take different parts of nature and create a landscape of my own. Not only does this approach give me a lot more freedom with the composition, it also loosens my brush strokes and kindles my creativity. I feel like that I am no longer painting a landscape, but the landscape itself becomes the painting. With my paintings this semester I am attempting to use the paint to mimic my subject: specifically, the frosting of cupcakes and pastries. Using bright colors in my subjects and dull backgrounds, I am bringing these desserts to life with startling contrast. I am also expanding the scale exponentially so that I can take a closer look at a detailed object that in actuality, is quite tiny. I love the idea of taking something small that is meant to be consumed and enlarging it while also making its existence permanent (and cruelly inedible). My paintings explore the different interactions between the skeleton and the human form. They contrast each other with the skeleton displaying the architecture of the human body verses the curving forms of the model. I wanted to experiment with ink wash to contrast brush strokes to help emphasis this contrast. This piece is done in vine charcoal and blackboard chalk on brown paper. The skeleton is posed and rendered in a way more often associated with traditional portraiture as opposed to still life, to show that the skeleton is not merely an object, but more part of a person. The skeleton is a paradox. It is inanimate; it is the very face of death. Yet they can be seen everyday, moving within our bodies. I decided to explore that paradox, and attempt to reanimate the skeleton as a figure. Under the influence of Pontormo and Kooning, I wanted to give the skeleton life using line. I juxtaposed different skeletons and manipulated the layer effect by using a variety of materials. Drawn to the challenge the bones’ relentless inflexibility presented, increasingly I am working to find ways to stretch the skeleton, as a figure and on the page. These are a few of my first drawings in this developing project. I really enjoyed Becky Parker’s rendition of the overlooked moments which pass us everyday. I think she captured the view of a passenger on a subway with stellar accuracy, and one can tell that her philosophy regarding time in space is presented in a bright and exciting fashion.